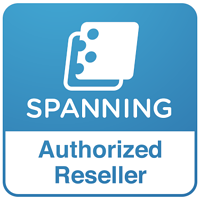 Cloudbakers partners with Spanning to further enhance the products you already know and love. Spanning Backup for G Suite is the top-rated backup and recovery solution on the Google Marketplace, is SSAE 16 Type II compliant, and has a 99.9% uptime SLA (service level agreement). It provides automatic, daily backup and recovery for Gmail, Drive, Calendar, Contacts and Sites - and, it comes with the industry’s only 100% Restore Guarantee. Spanning Backup for G Suite minimizes risk of data loss in the cloud, assures data availability, meets audit requirements for backup and recovery, and offloads IT by empowering users to easily restore lost data in just a few clicks. It's advanced administrator options include the ability to customize backup settings and manage licenses easily, giving administrators the control they need to manage their domain. With Spanning Backup for G Suite, all of the G Suite data in your domain is automatically backed up every day in the background. And for more frequent backups, administrators or users can initiate a full backup of their account at any time. Spanning makes it easy to find your lost data fast with advanced search capabilities. Once your lost data is found again, restore it right back into G Suite, either into the original user’s account or another user’s account. There’s also the option to export data as well as restore it. Spanning Backup for G Suite alerts administrators - in the app and via email - to any problems with their backups so that they can be corrected quickly. Plus, our Audit Log shows a full view of activity history so administrators can see how others have used the application across their domain. 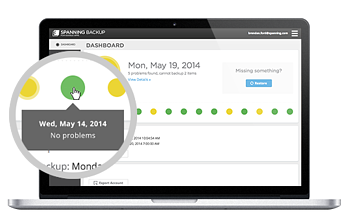 Spanning has you covered on cloud backup.